feature for your ad unit settings. Approximately 24 hours after you set up an experiment in your account, you’ll see a confidence score for the two ad units settings. This score indicates how likely the original or the variation is to be the better performing setting in the long term. Confidence scores may change as the experiment progresses, and we recommend waiting until one of the scores reaches at least 95% before choosing that setting as the winner. 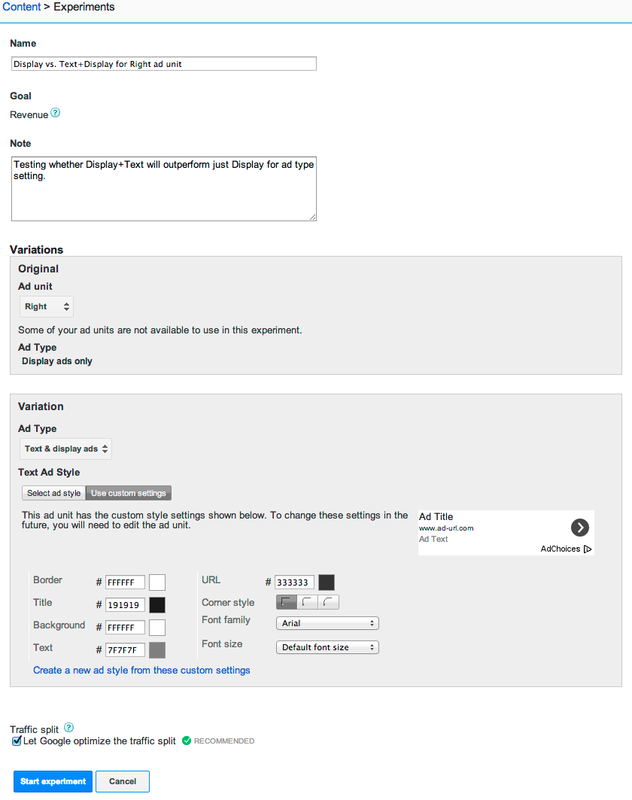 Once you chose the winning setting, the experiment ends and the setting is automatically applied to the specific ad unit. Please note that while an experiment is running, our system will automatically optimize the traffic split between the two ad unit settings. The better one setting performs, the more traffic it will receive, helping you maximize your revenue potential even during the experiment. Give A/B experiments a try using this new feature to ensure you’re getting the most out of your ad units. To learn more about AdSense experiments, visit our Help Center. We look forward to hearing what you think - feel free to share your thoughts and feedback on our AdSense +page. If you’re a regular blog reader, you know that we regularly emphasize the importance of testing changes to your ads to ensure they’re performing as well as they could be. The most effective way to do so is by running an A/B experiment to compare how one setting performs against a slight variation of that setting. To make it even easier for you to run A/B experiments, today we’re releasing a new AdSense experiments feature for your ad unit settings.